Jamaica's Usain Bolt said he is not concerned about breaking records ahead of the Diamond League meeting in Stockholm on Friday. Triple Olympic and world champion Bolt races in the 200m, having lost his two previous outings in Sweden's capital. 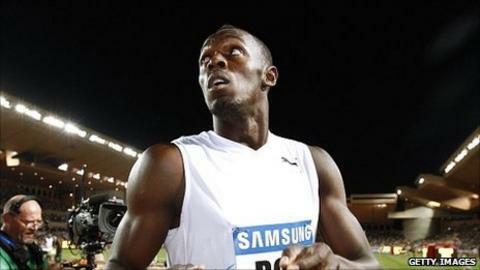 "Everyone knows by now I'm all about the gold medals," said Bolt, the world record-holder at 100m and 200m. "I'm going [to the World Championships in Daegu in August] to defend my titles, and that's the only aim." Bolt, who won the 100m, 200m and 4x100m at the 2008 Beijing Olympics and the Berlin World Championships the following year, added: "I want to be a legend, and if I want to do that I have to defend my titles successfully." Bolt, 24, feels his training regime is paying off, having concentrated on strengthening his back and leg muscles during the season and doing less upper-body work, as well as analysing his running technique. "I need to work a little more on my start but technical-wise I'm getting there," said Bolt, who feels he is peaking at the right time of the season. "I'm feeling great, my technique over 200m is always the best, so we can look forward to something good. "I went to the stadium on Wednesday, the curve felt a little bit tight, but I can handle it. I'm looking for a good time. As long as I execute and run correctly, a fast time should come." Among the other highlights at the Diamond League meet is Carmelita Jeter's return to her favourite 100m event. "After six 200m races back-to-back, it'll be nice to get back to my 'baby'," said the American, whose 10.64 seconds in 2009 made her the second-fastest woman ever over the distance. "This year I have actually been able to start a lot better. Usually I always had to come from behind to win a race or even get in a race. "But lately we have been working on my start, working on my strength and we have been doing a lot of longer runs since I am running the 200 now."